I have to tell you that I can’t stop thinking about testimonials. When my friend Suzi and I planned our webinar a few weeks back, we asked everyone attending to tell us what they want to learn about in regards to customer experience. Guess what? Over 50 of the 204 people registered for our webinar wanted to learn how to ask for testimonials. That’s 1/4 of you who struggle with the gathering of praise and love for your business. As an introvert and a Highly Sensitive Person to boot, I know firsthand how nerve wracking it can be to ask someone if they liked working with you or liked what they bought from you. After all, we are putting our heart’s work out there and then sheepishly asking someone to tell us if they liked it or not – that’s hard gut-wrenching stuff! Since I have been in your shoes and come thru to the other side (complete with a page full of loving heartfelt testimonials that show off the best of my work), I thought I’d share 15 of my favorite questions to ask when you do a request for testimonials. Note: Include these questions in a survey request in your follow up sequence. Use some of the questions below to get you started (please don’t use all of the questions – just pick a few!) Then sure to ask for their permission to craft their responses into a testimonial. Once you’ve done that, send it to them for approval with a request for a headshot (headshots along with testimonials on websites = social proof). What’s your job title/what do you call yourself? What are the top three adjectives that describe how you felt before we worked together? What prompted you to sign up to work with me? How would you describe this program/service to someone else? What three adjectives describe how you feel now that we’ve worked together? What’s your favorite part of this solution to your previous problem? How was our work helpful to your business? What was your biggest ah-ha moment? Did our work together help you meet a specific goal? If so, what? What direct results did you have (if any) from our work together? Who do you know that would benefit from more work like this? What one thing should people know about working with me? Would you recommend this work to anyone you know personally? Would you work with me again in the future? Ask specific and leading questions and watch those rave testimonials come rolling in. And to get even more testimonial gathering goodness, snap up your copy of the how-to guide by entering your info in the box below. Get the Testimonial Gathering Swipe Copy! 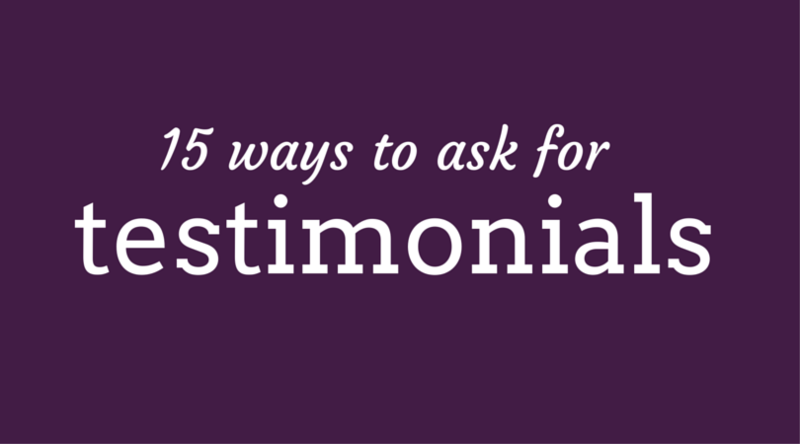 Get the worksheet to gather testimonials in a non-sleazy way. Enter your email address below to get it delivered straight to your inbox.